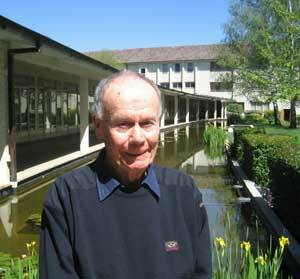 Don Mathewson is a radiophysicist and astronomer. He was recruited to CSIRO Radiophysics by Joe Pawsey in the 1950s, did his PhD at Jodrell Bank Observatory under Robert Hanbury Brown, and also where he knew Bernard Lovell. After returning to Australia he eventually became Director of Mt Stromlo and Siding Spring Observatories, and Professor of Astronomy at the Australian National University. He discovered the Magellanic Stream, had an advanced telescope built at Siding Springs, did major work on galaxy structures and supernova remnants, and the structure of the universe. After retirement he lost all his papers and memorabilia in the bushfires on Mt Stromlo in 2003. This interview © Copyright Don Mathewson & Craig Robertson, 2008. Note: This interview was recorded by Craig Robertson in a sound studio at the National Library of Australia. Many thanks to Kevin Bradley, Curator, Oral History and Folklore, NLA, and his staff for their generous assistance. In my study: Alone at night - notes on quietness, concentration, Raymond Chandler and astronomers; see In my study No.11 (4.2 Mb; 4' 35"). See: The life of Raymond Chandler by Frank MacShane (E.P. Dutton, New York, c.1976).